Introduction: One of the most common denture repairs is the replacement of detached acrylic resin teeth. Given one of the advantages of acrylic teeth is the ability to chemically bond to denture base resins. The ability of acrylic teeth to bond to denture base resins may also be affected by the type of denture teeth. Studies have addressed the degradation at the acrylic teeth/denture base resin interface as a result of thermal stress. Hence, the aim of this study was to determine the shear bond strength of commercially available heat-polymerized acrylic resins to denture base resins to acrylic resin teeth before and after thermocycling. Materials and Methods: Two heat-polymerized denture base resins (Meliodent and DPI) were selected and bonded to acrylic resin molar teeth. A total of 60 samples were prepared and divided into two main groups: 30 for Meliodent and 30 for DPI. These were again divided into two subgroups: with and without thermocycling. For half the number of samples of each brand, thermocycling was carried out and shear bond testing was done, using Instron universal testing machine. The findings were statistically analyzed and the shear bond strength was calculated in Map. Results and Conclusion: After comparing the results, it was found that the shear bond strength was not significantly affected before and after thermocycling for these two heat-polymerized denture base resins. Among two, Meliodent was found better denture base material for bonding to acrylic resin molar tooth than DPI, before and after thermocycling. Acrylic teeth are most widely used and preferred over porcelain teeth due to their wide range of desirable properties. Polymethyl methacrylate material has become the most popular artificial material for denture teeth, due to ease of manipulation and easy availability at low cost. Apart from the advantage of economy, it also bonds chemically to the denture base and has a lifelike appearance, translucent quality, even in thin sections. These teeth bond well to denture base resin can be easily ground, recontoured, and polished without compromising their properties. Adequate bonding of acrylic resin teeth to denture base resin is necessary because it increases the strength and durability of the denture since the teeth become an integral part of the prosthesis. Adequate bonding of acrylic resin teeth to acrylic denture base increases stiffness and strength of prosthesis. Two processes affect the achievement of chemical bond between teeth and denture base resin. First, the polymerizing denture base resin must come into physical contact with denture tooth, and second, the polymer network of the denture base resin must react chemically with the denture tooth. Chemical or mechanical treatments carried out on ridge lap surface may increase bond strength between tooth to denture base resin interface. Examples of chemical treatment include the application of monomer, dissolved polymethyl-methacrylate, and nonpolymerized solvents such as dichloromethane and trichloromethane (chloroform) combination of the above. Mechanical modifications can be carried out by different means, for example, making horizontal or vertical grooves on ridge lap surfaces of teeth with a cylindrical fissure bur, ridge lap surfaces prepared for a diatoric, drilled on the palatal surfaces of teeth, and roughened or sandblasted with 250 μ grit in sandblasting machine. Results showed that conventional acrylic resin denture base material bonds better with conventional resin denture teeth as compared to highly cross-linked denture teeth. Chemical or mechanical preparation of tooth surface before bonding has mixed results on bond strengths. Intraoral temperature changes may be induced by routine eating, drinking, and breathing. Thermal stresses can be pathogenic in two ways. First, mechanical stresses induced by differential thermal changes can directly induce crack propagation through bonded interfaces. Second, the changing gap dimensions are associated with gap volume changes which pump pathogenic oral fluids in and out of the gaps. This cyclical flow has been incorrectly termed “percolation.”, These temperature changes can alter the interface between the acrylic resin teeth and acrylic resin denture base. Laboratory simulations of clinical service are often performed because clinical trials are costly and time-consuming. Thermocycling is an in vitro process used to simulate the oral condition. This treatment theoretically allows for repeated expansion and contraction of tooth and denture base resin components, thereby stressing the bond. The secondary benefit of thermocycling was hydration of the specimens, which further simulated the clinical condition. The deterioration in bond strength was attributed to leaching of monomer and water sorption resulting in some interfacial separation. The purpose of this study was to evaluate and compare the shear bond strength of two commercially available heat-polymerized denture base resins to acrylic resin teeth, before and after thermocycling. Approval from Institutional Ethical Committee was taken before starting the study. Two different brands of commercially available and commonly used denture base materials were used DPI Heat Cure™ Denture base material (Dental Products of India Ltd., Batch No. 2135) and Meliodent (Heraeuskruzier GmbH N Company, KG, Batch No. 23208). Autopolymerized acrylic resin (DPI-RR Cold Cure Dental Products of India Ltd., Batch No. 3132), Acry Rock Molar teeth (Ruthenium, Batch No. 1345), and Type II dental stone (Kalabhai Karson Pvt., Ltd., India, Batch No. 130050). Six hundred grit Silicon carbide paper. Equipment used for fabrication of samples: Acrylizer with thermostat and thermocycling machine. Testing equipment: Universal testing machine (Model No. STS 248 Star Testing System, India). According to the ADA specification number 16, samples were prepared which established the standards for testing of acrylic resin denture tooth for various physical properties. The steps involved in this method of study were: (1) fabrication of small circular stainless steel mold and circular stainless steel ring mold, (2) preparation of combination samples of acrylic molar tooth with autopolymerizing acrylic resin, (3) preparation of gypsum mold, (4) preparation of combination samples of molar tooth and resin to denture base resin, (5) thermocycling of the combination samples of acrylic molar tooth and resin to denture base resin, (6) testing of shear bond strength of the samples. 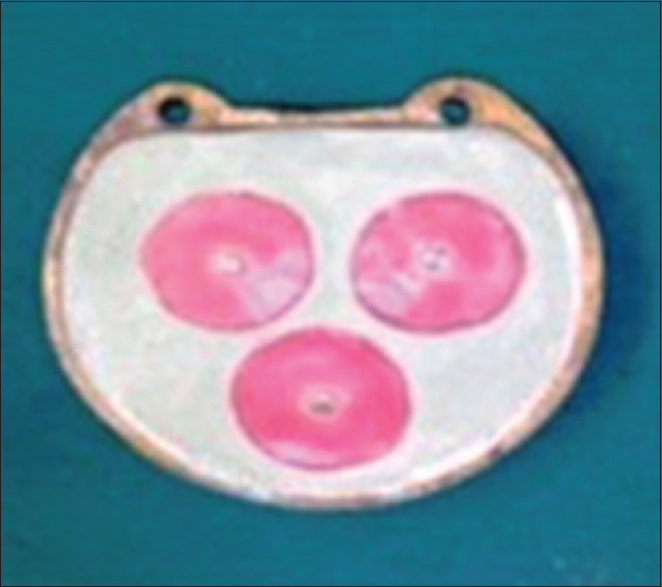 Fabrication of small circular stainless steel mold (5 mm diameter × 2.5 mm length) and circular stainless steel ring mold (30 mm diameter × 8 mm length) [Figure 1] to standardize the dimensions of the denture base resin cylinders. And also for preparation of combination samples of acrylic molar tooth with autopolymerizing acrylic resin. Autopolymerizing acrylic resin mixed material was placed into the ring, placing the occlusal surface of molar tooth toward glass slab and exposing the ridge lap surface above. The exposed ridge lap surface of embedded tooth was ground flat, using 600 grit silicon carbide paper for breaking the glaze thus fascinating bonding of denture base resin to the tooth surface. Thus, a total of 60 combinations of molar teeth with resin samples were fabricated. This was followed by attachment of the stainless steel small circular metal mold to center of ridge lap surface of acrylic molar tooth using a drop of cyanoacrylate glue. The combination sample of acrylic molar tooth to resin was used to prepare gypsum mold for the fabrication of test specimens. These were invested in the varsity flask. The flask was opened carefully after 30–40 min. The small circular stainless mold metal mold was separated from each acrylic resin molar tooth. The remnants of cyanoacrylate glue attached to the tooth surface were removed again using 600 grit silicon carbide paper. In this way, a total of 60 samples were made and kept ready for packing with denture base material into the mold cavity. These were divided into two main groups, 30 for packing using DPI and 30 using Meliodent denture base material. Mixing and processing of DPI and Meliodent denture base material was done as per the manufacturer's instructions. Curing was carried out for 2 h at 74°C, and then, temperature was increased to the boiling point of 100°C for 1 h. Curing was followed by deflasking. The cured samples were retrieved from the mold and were carefully finished and polished. The 30 samples each group were again divided into two subgroups: (1) Group M (Meliodent before thermocycling), (2) Group M-TH (Meliodent after thermocycling), (3) Group D (DPI before thermocycling), and (4) Group D-TH (DPI after thermocycling). All the samples were stored in distilled water till the tests were performed. A total of 15 samples of each Group M-TH and D-TH were kept separately in two different glass bowls, filled with water. First, the samples were carried to cold section till the temperature of 4°C is reached and then carried to hot section with a dwell time of 30 s, till the temperature reached at 60°C. Thus, thermocycling was carried to cold and hot sections alternatively for 5000 cycles between 4°C and 60°C with a dwell time of 30 s. Finally, the samples were stored in distilled water at room temperature. The remaining 15 samples of Groups M and D were stored in distilled water without thermocycling (Control Group). Strength = Force per unit area. The maximum load, which was computerized calibrated on the testing machine was determined from the chart and recorded as a fracture load in N (Newton) and the shear bond strength was calculated in Mpa. The results were statistically analyzed in sequential manner. Statistical analysis was done using paired and unpaired t-test. For Group M [Meliodent without, [Table 1] and [Table 2], highest shear bond strength was 23.03 Mpa and lowest was 12.43 Mpa with a mean strength of 17.13 Mpa and standard deviation of 3.27 Mpa. The mean load was 335.67N, with standard deviation of 63.32. For Group M-TH [Meliodent with thermocycling, [Table 1] and [Table 2], the highest shear bond strength was 24.75 Mpa and lowest was 6.87 Mpa with a mean strength of 16 Mpa and standard deviation of 5.12. The mean load was 313.23N, with standard deviation of 98.52. For Group D [DPI without thermocycling [Table 1] and [Table 2], the highest shear bond strength was 20.19 Mpa and lowest was 10.38 Mpa with a mean strength of 15.47 Mpa and standard deviation of 3.29. For Group D-TH [DPI with thermocycling, [Table 1] and [Table 2], the highest shear bond strength was 20.73 Mpa and lowest was 9.45 Mpa with a mean strength of 15.13 Mpa and standard deviation of 3.39. Shear bond strength was compared before and after thermocycling using the paired t-test and unpaired t-test, respectively. Comparing the shear bond strength between Group M and M-TH, there is no significant difference between them with P = 0.476 (P > 0.05). Between Group D and D-TH, there is no significant difference between them with P = 0.787 (P > 0.05). Between M and D, there is no significant difference between them with P = 0.175 (P > 0.05). Between M-TH and D-TH, there is no significant difference between them with P = 0.590 (P > 0.05) [Graph 1] and [Graph 2]. The combination of properties of polymethyl methacrylate material rather than one single desirable property accounts for its popularity and usage in dentistry. This material with a small quantity of cross-linking comonomers is the most widely used denture base material. The polymers are multiphase with a slightly cross-linked polymer matrix between the polymer beads, which are cross-linked from the outermost layer only. Despite its popularity in satisfying esthetic demands, it is still far from ideal in fulfilling the mechanical requirements of prostheses., Bond strength between denture base and acrylic teeth is important for the successful prosthesis. Two processes affect the achievement of a bond between the acrylic teeth and denture base resin: (i) the polymerizing denture base resin must come into physical contact with the denture tooth resin and (ii) the polymer network of denture base resin must react with the acrylic tooth polymer to form an interwoven polymer network. Debonding may be the result of incompatible surface conditions at the tooth and base interface. The factors that contribute to this discrepancy are (i) contamination of the joining surfaces and (ii) different structure of the two components because of their different processing routes. In the present study, two different types of high-impact denture base materials were used as Huggett et al. and Retcher et al. have suggested that the quality of the denture base material may contribute to the bond strength of the tooth to the denture base and concluded that high-impact, heat-cured denture bases give a better bond than do autopolymerizing or nonhigh-impact, heat-cured denture bases. Furthermore, different types of denture base resins also affect the bond between acrylic teeth and denture base resins. Several studies have compared the bonding of acrylic teeth to microwave-polymerized, light-polymerized, heat-polymerized, and autopolymerizing denture base resins, and observed that heat-polymerized resins revealed the highest bonding values. Prefabricated acrylic resin teeth for dentures were introduced in 1940. Apart from the advantage of economy, it bonds chemically to the denture base and has a lifelike translucent quality; even in thin sections of less than 1mm. in this way, teeth become an integral part as well as functional portion of the prosthesis, also the stiffness and strength of the entire denture increases. The molar denture tooth used in the present investigation was cross-linked acrylic resin polymer with an added filler of colloidal silica to add strength, which is added to the methyl methacrylate for strength and abrasion resistance. Different modifications on the ridge lap surface of different types of the acrylic resin teeth had been suggested by various authors. Barpal et al. 13] in his study demonstrated the failure load of bonding highly cross-linked denture teeth to acrylic resin can be significantly influenced by modifications to the ridge lap before processing. Cardash et al. compared the effects of vertical and horizontal grooves on ridge lap surface of denture teeth bonded with standard and high-impact acrylic resin for central incisor, lateral incisor, and canine. They found that vertical grooves have superior retention in all tooth types than the horizontal grooves, suggesting that vertical grooves are closer to the point of application of the force and a short lever arm requires a greater force to separate the tooth from denture base. Barpal et al. compared two different type of acrylic resin bonded to highly cross-linked teeth and found that diatoric increases the bond strength with one type of resin and decreased with other type of resin. Saavedra et al. compared the effects of sandblasting of ridge lap surface with 110 μ aluminum oxide particles on two different types of teeth and three types of acrylic resins and found it to be insignificant. Huggett et al. compared bond strength between three different types of surface treatments, grinding, and making a retention groove and found that there was no improvement in bond strength between these groups. This finding is in agreement with the present study. Bragagli et al. used roughening the ridge lap surface with sandblasting and burs and found that both increased bond between denture base and acrylic teeth with sandblasting showing higher failure loads which are in contrast to this study. Saavedra et al. compared different surface modifications and found that sandblasting is better than no surface modification in tensile test in contrast to the present study, he found chemical and mechanical modification provide maximum adhesion. Oral environment is subjected to constant temperature changes from the vastly different temperatures of food that we ingest. It is well-known fact that the junction between materials with different coefficient of thermal expansion is the focus of thermal stress as temperature fluctuates. Thermocycling is an in vitro process used to simulate in vivo events and is often represented in these studies. Air temperature, humidity, and air velocity when breathing can radically alter even resting mouth temperature. However, with no thermal load and no mouth breathing, intraoral temperature has been measured at 35.2 (6 2.1) 8°C,, and as “approximately” 35°C. The range of temperature used had an upper limit being 45–60°C and lower limit 4–15°C, which was based on changes in temperature that are within normal extremes in the oral cavity. This theoretically allowed for repeated expansion and contraction of the tooth and denture base components, thereby stressing the bond. The secondary benefit of thermocycling was hydration of the specimens, which further simulated the clinical conditions. However, the statistical data after comparing the shear bond strength between M and D, revealed that there is no significant difference, (P = 0.175 P > 0.05). Also comparing the shear bond strength between M-TH and D-TH, found no significant difference, (P = 0.590 P > 0.05). 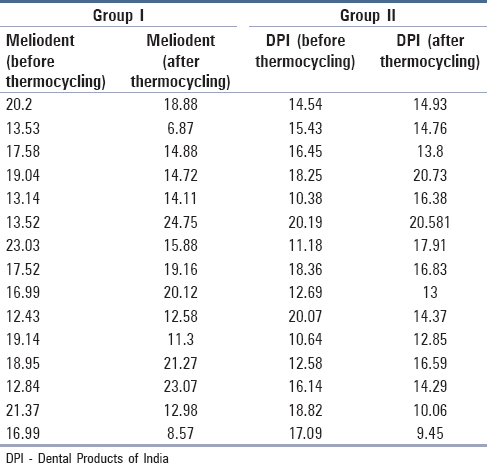 Thereby both the groups, Meliodent and DPI, do not show significant difference after thermocycling. This is because acrylic teeth and the acrylic resin denture base have nearly the same coefficient of thermal expansion (80–81 × 106/°C); therefore, this similarity reduced the chance for the creation of thermal stress, so the bond strength was not affected by such thermal fluctuation. Saavedra et al. evaluated the shear bond strength between acrylic teeth and a heat-polymerized acrylic resin at dry and thermocycled conditions (60 days water storage followed by 12,000 cycles). Those authors found that the bond strength was significantly affected by the storage conditions (dry > thermocycled). Marra et al.,, observed that thermocycling resulted in a significant decrease in the shear bond strength between a heat-polymerized denture base acrylic resin and Biotone denture teeth. Conversely, the results of this investigation are in accordance with those reported by Barbosa et al., they verified that the shear bond strength of Onda-Cryl and Clássico resins to the Biotone denture teeth was not significantly affected by thermocycling. The differences between the current results and those reported by Saavedra et al. and Marra et al. were attributed to the number of thermocycles and different materials used. Barbosa et al. stated that thermocycling and polymerization methods influence the bond strength between acrylic resin and artificial teeth. Thermocycling decreased the bond strength, but not significantly for microwave and heat polymerized cycles. In addition, according to Schneider et al., the hydration of the specimens further simulates the clinical condition. However, in the present study, there was no statistically significant difference between thermocycled and nonthermocycled samples for all evaluated groups. Commercially, vast numbers of teeth and denture base resins are available for denture construction. However, there is usually little or no mention of bond strength or compatibility of acrylic teeth to the denture base resins by the manufacturers. When the entire spectrum of this study is analyzed, after modification of the ridge lap area of the acrylic resin molar tooth, demonstrated an increase in bond strength. 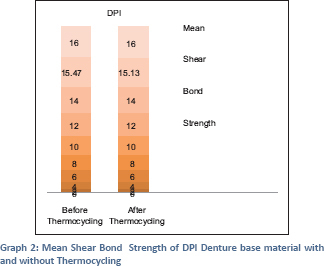 It becomes evident that the shear bond strength of Meliodent denture base material is higher than DPI denture base material before and after thermocycling. After comparing these two denture base resins, Meliodent was found better material for bonding to acrylic resin molar tooth than DPI, before and after thermo-cycling. Although some differences in the shear bond strength were found among these materials, when bonded to acrylic resin molar tooth, before and after thermocycling, the statistical data showed that these values are nonsignificant. Therefore, clinically, either of these materials can be used in day-to-day clinical practice. As Schneider et al., also reported that selection of more compatible combinations of acrylic teeth and denture base resins may reduce the number of prosthesis failures, the resultant repairs, and rupture of the material to slide against itself. This is an in vitro study, therefore, its direct applications in clinical practice cannot be implicated. Scope for further studies – Recommended to investigate other material combinations for predicting the success and providing best material in clinical service. Clinically, either of these materials can be used in day-to-day clinical practice as per the operator's choice. The ability of acrylic teeth to bond to denture base resins may also be affected by the type of denture teeth. Studies have addressed the degradation at the acrylic teeth/denture base resin interface as a result of thermal stress. 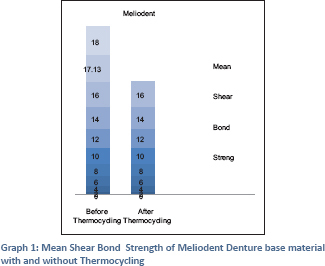 The shear bond strength of commercially available two types of heat-polymerized acrylic resins to denture teeth base resins, before and after thermocycling, proved that the shear bond strength was not significantly affected before and after thermocycling for these two heat-polymerized denture base resins. Meliodent was found better material for bonding to acrylic resin molar tooth than DPI, before and after thermocycling. Cunningham JL. Shear bond strength of resin teeth to heat-cured and light-cured denture base resin. J Oral Rehabil 2000;27:312-6. Patil SB, Naveen BH, Patil NP. Bonding acrylic teeth to acrylic resin denture bases: A review. Gerodontology 2006;23:131-9. Takahashi Y, Chai J, Takahashi T, Habu T. Bond strength of denture teeth to denture base resins. Int J Prosthodont 2000;13:59-65. Gale MS, Darvell BW. Thermal cycling procedures for laboratory testing of dental restorations. J Dent 1999;27:89-99. Morrow RM, Matvias FM, Windeler AS, Fuchs RJ. Bonding of plastic teeth to two heat-curing denture base resins. J Prosthet Dent 1978;39:565-8. Gay WD, King GE. An evaluation of the cure of acrylic resin by three methods. J Prosthet Dent 1979;42:437-40. Barbosa DB, Monteiro DR, Barão VA, Pero AC, Compagnoni MA. Effect of monomer treatment and polymerisation methods on the bond strength of resin teeth to denture base material. Gerodontology 2009;26:225-31. Anusavice KJ, editor. Denture base resins. Phillips' Science of Dental Materials. Pennsylvania, PA: Saunders; 1996. p. 211-53. Craig RG, Powers JM. Restoration Dental Material. 11th ed., St. Louis: Mosby; 2002. p. 500-40. Marra J, de Souza RF, Barbosa DB, Pero AC, Compagnoni MA. Evaluation of the bond strength of denture base resins to acrylic resin teeth: Effect of thermocycling. J Prosthodont 2009;18:438-43. Büyükyilmaz S, Ruyter IE. The effects of polymerization temperature on the acrylic resin denture base-tooth bond. Int J Prosthodont 1997;10:49-54. Rabiakavrut D, EÞýlduymuÞ Z. Examination of bond strength of resin teeth to denture resins, Atatürküniv. DiÞhek Fak Cilt 2005;15:54-61. Barpal D, Curtis DA, Finzen F, Perry J, Gansky SA. Failure load of acrylic resin denture teeth bonded to high impact acrylic resins. J Prosthet Dent 1998;80:666-71. Cardash HS, Liberman R, Helft M. The effect of retention grooves in acrylic resin teeth on tooth denture-base bond. J Prosthet Dent 1986;55:526-8. Saavedra G, Neisser MP, Coelho Sinhoreti MA, Machado C. Evaluation of bond strength of denture teeth bonded to heat polymerized acrylic resin denture bases. Braz J Oral Sci 2004;3:458-64. Huggett R, John G, Jagger RG, Bates JF. Strength of the acrylic denture base tooth bond. Br Dent J 1982;153:187-90. Bragaglia LE, Prates LH, Calvo MC. The role of surface treatments on the bond between acrylic denture base and teeth. Braz Dent J 2009;20:156-61. Saavedra G, Valandro LF, Leite FP, Amaral R, Ozcan M, Bottino MA, et al. Bond strength of acrylic teeth to denture base resin after various surface conditioning methods before and after thermocycling. Int J Prosthodont 2007;20:199-201. Al-Huwaizi AF. An evaluation of the effect of retention means on increasing the debonding strength of the denture acrylic teeth attached to the denture base resin. J Coll Dent 2005;17:14-7. Cunningham JL, Benington IC. Bond strength variation of synthetic resin teeth in dentures. Int J Prosthodont 1995;8:69-72. Schneider RL, Curtis ER, Clancy JM. Tensile bond strength of acrylic resin denture teeth to a microwave- or heat-processed denture base. J Prosthet Dent 2002;88:145-50. Cunningham JL, Benington IC. A survey of the pre-bonding preparation of denture teeth and the efficiency of dewaxing methods. J Dent 1997;25:125-8. Cunningham JL, Benington IC. An investigation of the variables which may affect the bond between plastic teeth and denture base resin. J Dent 1999;27:129-35. Aljudy HJ, Hussein AN, Safi IN. Effect of surface treatments and thermo cycling on shear bond strength of various artificial teeth with different denture base materials. J Baghdad Coll Dent 2013;25:5-13. Ali H, Fatah NA. The shear bond strength of artificial teeth with denture bases. J Baghdad Coll Dent 2009;21:15-20. Chung KH, Chung CY, Chung CY, Chan DC. Effect of pre-processing surface treatments of acrylic teeth on bonding to the denture base. J Oral Rehabil 2008;35:268-75. Chaves CA, Regis RR, Machado AL, Souza RF. Effect of ridge lap surface treatment and thermocycling on microtensile bond strength of acrylic teeth to denture base resins. Braz Dent J 2009;20:127-31. Amarnath GS, Indra Kumar HS, Muddugangadhar BC. Bond strength and tensile strength of surface treated resin teeth with microwave cured and heat cured acrylic resin denture base: An in vitro study. Int J Clin Dent Sci 2011;2:27-32.